The Tinder chat twist that Brad never saw coming. Scary Tinder stories. When Brad asked his Tinder date to meet up, she couldn't because she was... having a baby. Online dating is a quick, uncomplicated, and sure fire way to find the love of your life – said no single person ever. Sure, it’s possible, but for most people, on the way to finding their Prince or Princess Charming, they’re usually sent unsolicited genitalia pics, catfished, blocked and/or ghosted, at least 300 times. Occasionally, you find someone willing to be direct with you, as a young man named Brad Galloway, from North Yorkshire, England, did this week. On New Year’s Eve, Brad matched on dating app Tinder with a woman nearby. The pair chatted for a while, and then Brad politely enquired what the woman was doing for the day. Now, it would have been reasonable of him to expect she might have plans, considering it was New Year’s Eve, but there was no way he could anticipate the enormity of what those plans were. 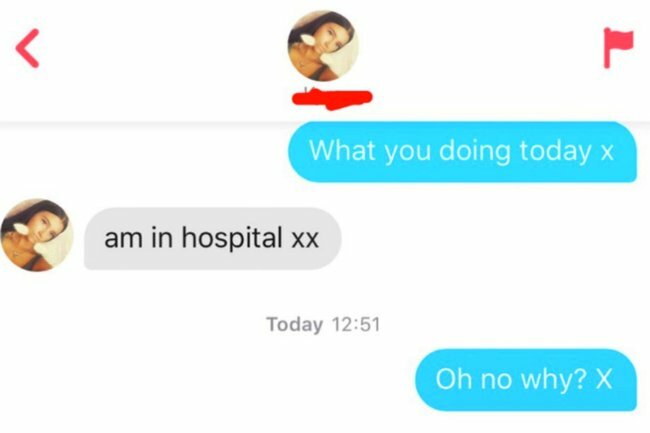 “Am in hospital,” the woman responded to Brad’s question. Yes. You see, this woman had other plans… At least she was honest, right? Brad did not exactly see it that way; feeling rightfully a bit miffed, because the whole point of online dating is to meet up with people who are free to meet up, not those literally in the midst of childbirth. Considering the woman’s casual and very candid responses, it’s easy to see why the tweet immediately went viral, with over 127,000 likes and 20,000 retweets. But Brad Galloway no. 2 knew that Brad Galloway no. 1’s day was already “shite”, so he had his back. “Us Brad Galloways stick together,” BG2 Tweeted, outing the identity of the woman who’d had a go at BG1. The original Brad may not have found a date for that night, but at least he found a brother-in-name – and about 127, 000 new online supporters. Do you have an online dating horror story? Tell us in the comments below!